STRATA is a coming together of three extraordinary musical talents: Audrey Andrist, piano; Nathan Williams, clarinet; and James Stern, violin and viola. Strata brings “deft ensemble playing” and a “talent…that’s worth getting worked up about” [Washington Post] to a repertoire that combines the great trio and duo repertoire of the past with an ever-growing body of new works written especially for them over the more than 25 years they have been playing together. Our January program opens with the charming Prelude, Allegro, and Pastorale for clarinet and viola by British born Rebecca Clarke. The work was first performed at the 19th Festival of the International Society for Contemporary Music in Berkeley, California where 30 composers from 13 nations were represented. Clarke was the only female whose work was represented. Clarke described the piece as follows: "The whole thing is very unpretentious: a short, unassuming little prelude . . . The second movement should sound very spirited . . . 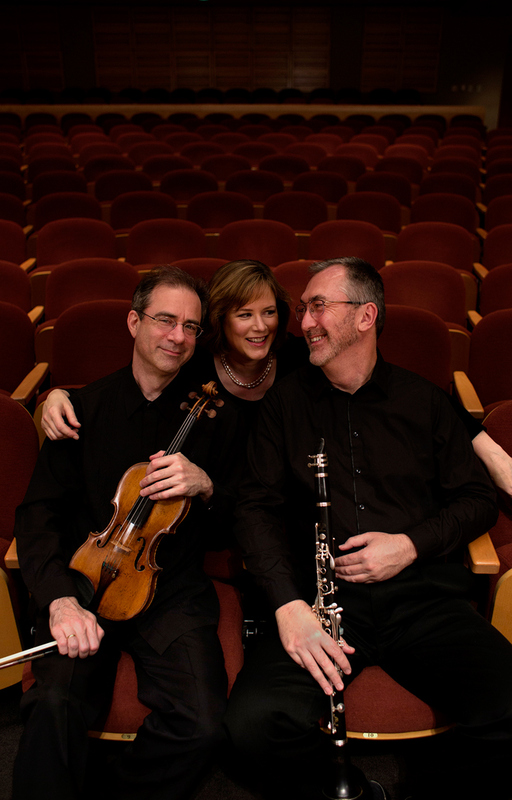 The third movement is rather melancholy and nostalgic. . "
Following an intermission, Strata will return to perform Mozart's classic Trio for Clarinet, Viola, and Piano, KV 498. A staple of the chamber music repertoire, this trio has long borne the nickname "Kegelstatt", essentially meaning "bowling alley". According to a popular story, Mozart composed this trio between frames of Kegeln, a Central European nine-pin lawn bowling game. Yet while Mozart, by his own admission, composed a few pieces while enjoying games and drinks at ninepins, this trio does not appear to be one of them, so the "Kegelstatt" moniker is something of an urban legend, more a commentary of Mozart's reputation than a biographical fact. Composed for Mozart's dear friend, Anton Stadler, who was the most celebrated clarinetist of his day, the trio is cast in three movements, opening unconventionally with the slow movement. The second movement is in the form of a minuet and dance. The finale is a warm and inviting rondo. The program comes to an exciting conclusion with Alexander Arutiunian's riveting Suite for Clarinet, Violin, and Piano, composed in 1992. Arutiunian's compositional style is heavily influenced by Armenian folk music, and the trio moves from sweet, simple melodies to energetic Armenian dance rhythms with their capricious pulse and unexpected irregularities in a freely improvised melodic style. It’s a piece you’ll fall in love with! Strata is a coming together of three extraordinary musical talents: Audrey Andrist, piano; Nathan Williams, clarinet; and James Stern, violin and viola. Their combined credits encompass numerous international prizes and performances across four continents including such places as Carnegie Hall, the Marlboro Festival and the Kennedy Center. Strata brings “deft ensemble playing” and a “talent…that’s worth getting worked up about” [Washington Post] to a repertoire that combines the great trio and duo repertoire of the past with an ever-growing body of new works written especially for them over the more than 25 years they have been playing together. Equally capable of winning over an audience with unique renderings of popular music and of making even the most complex works accessible, exciting and meaningful, Strata has received enthusiastic repeat engagements at the Piccolo Spoleto Festival, New York’s historic Maverick Concertsand San Francisco Composers Inc, for which they were listed as one of San Francisco Classical Voice’s “highlights of 2005.” They have been resident artists at the Banff Centre for the Arts and appeared in New York City under the auspices of the International Society for Contemporary Music. All holders of the Doctor of Musical Arts degree from the Juilliard School, the members of Strata are dedicated to every level of music education, from the mentoring of graduate students and young professionals, to the initial sparking of musical passion in very young children, to the guiding of audiences in what to listen for. Spoken commentary is an integral part of all their concerts.